A trailer truck carries a container at a pier in Tokyo. 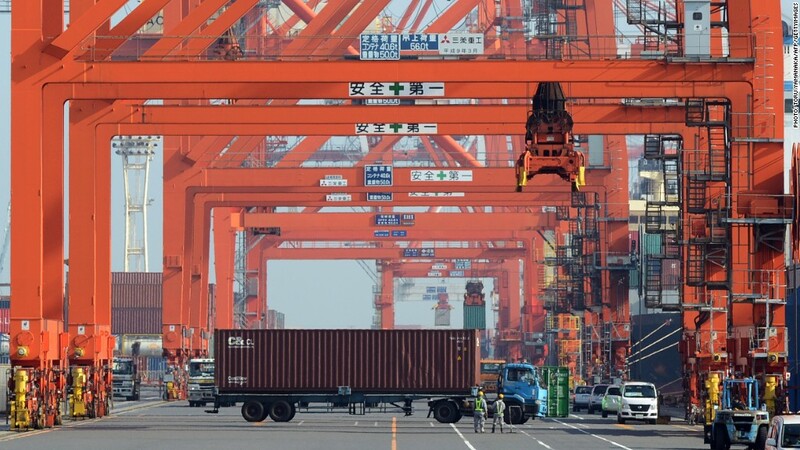 Japan's government said Friday that both industrial production and prices fell in August, the latest round of bad news for the world's third largest economy. Industrial production was down 1.3% -- the second consecutive monthly decline -- and a more severe drop than economists had expected. The automotive and electronics industries were hardest hit, the Ministry of Economy, Trade and Industry said. A survey of manufacturers forecast production will fall another 2.9% in September and remain flat in October, the report said. Manufacturers have been under pressure in Japan, especially as demand for exports to China -- a major trading partner -- has fallen and the yen remains high against the U.S. dollar. In addition, a territorial dispute between the two economic powers over islands located in the East China Sea has set both nations on edge, and some Japanese businesses operating in China have been forced to temporarily stop production. A separate report issued Friday by Japan's statistics bureau indicated that prices fell last month. Japan's core inflation index, which does not account for food prices, slid 0.3% last month. August was the fourth straight monthly decline, and raised expectations of government action to prevent persistent deflation. Japan's government did release at least one bit of good news on Friday. The monthly employment ticked down to 4.2% in August from 4.3% the previous month.